AS THE delivery of old-fashioned letters wanes, SingPost has managed to tap effectively into the lucrative and fast-growing e-commerce market. It now has more than 200 corporate customers using its e-commerce services to manage online payments, deliveries or to offer online shopping to consumers. In its last financial year ended March 31, e-commerce accounted for 25 per cent of its total revenue of $658.8 million, said Mr Marcelo Wesseler, SingPost's senior vice-president for eCommerce. No figures were available from the previous year as the business unit had not been formed. "Global retailers rely on us to store, pack and deliver millions of parcels every day. Our customers come from 220 countries and territories," he told The Straits Times on Tuesday. To support customers, SingPost has 12 distribution centres across Asia, including Australia, Japan and India as well as two other centres in Portland, Oregon, in the United States and Egham, Surrey, in England. SingPost is getting into the e-commerce business as online shopping explodes, while its domestic mail business declines. 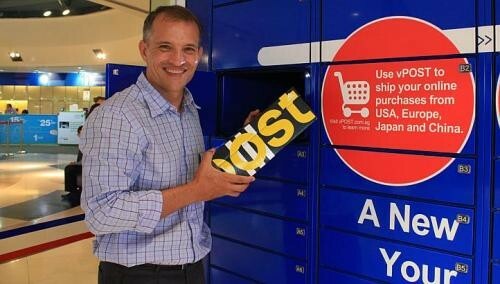 In an e-mail interview, SingPost group chief executive Wolfgang Baier said that e-commerce sales in the Asia-Pacific last year hit US$332 billion (S$416 billion) and it is expected to grow by 30 per cent this year. By 2013, the market will be worth US$443 billion, becoming the world's No. 1 market, overtaking North America, he added. The company's initial foray into e-commerce was in 2003 with its digital concierge service, vPost. Online shoppers for example can buy from different US online merchants and have them send their purchases to vPost's centre in Oregon. vPost will consolidate all the packages into one box for shipping to Singapore. This helps reduce shipping costs. Another of SingPost's e-commerce services is a luxury fashion e-shop called cloutshoppe.com which debuted in 2011. In the last 12 months, SingPost ramped up its e-commerce offerings by developing a platform to offer various services to retailers here and overseas. Said Mr Wesseler: "Our strategy is to be an enabler. We want to help US or European brands to establish online presence in Singapore as an e-commerce hub for their Asian business. "E-commerce is a capital-intensive business. We offer it as a service, so retailers just buy what they need, a total solution for an online shop or just warehousing and delivery and returns." One customer is sports brand Adidas. SingPost built an online shop for the company's Singapore operations in less than three months. "We'd to test it to ensure that it can withstand many same-time transactions. Our technology partner Amazon Web Services (AWS) helped us do this." AWS provides computing power to handle transactions. When transactions explode, such as at Christmas, AWS can release more computing power. During lulls, computing power can be scaled back, helping SingPost to cut costs and be more efficient. OCBC Investment Research is positive about SingPost's entry into the e-commerce business. "It is important for SingPost to stand ready to capitalise on the growing e-commerce market, especially given the limited growth of the traditional domestic mail business. "Hence, having an online store is a necessary move and more has to be done to develop the group's online presence, be it in Singapore or the region," said investment analyst Low Pei Han.